Throughout the 20th century, almost everything was “found” (or attempted to be found) in genes, music included. In 1986, the Japanese-American couple of the scientist Susumu Ohno and his wife Midori Aoyama, a singer, published an article in which they transposed the nucleotide sequence of certain genes to the pentagram. Now, 90 years after the birth of Doctor Ohno, it is stimulating to analyze where the idea of applying music to genes has taken us, which includes several recent theories for the use of the music found in genes and the genome for scientific and medical purposes. Prior to 1986, Susumu Ohno had already led an interesting career as a geneticist, highlighted by his theory on the mechanism governing the increase in gene and genome complexity and the origin of new genes throughout evolution, which was based on the repetition of gene fragments as well as genes and genomes and the subsequent differentiation of certain copies from the original ones. His observations that repetition and redundancy were frequent in the genes and genomes of living beings as different patterns are in music were precisely what led Doctor Ohno to think of the possibility of “listening” to the musical sounds of genes. It was at that point that Midori Aoyama provided her musical knowledge. Thus, in the article published by both in 1986 (1), they proposed the idea of assigning two consecutive positions of the musical scale (from the lowest to the highest): do, re, mi, fa, sol, la, si to each of the 4 nucleotide bases of the DNA in ascending order from adenine to guanine, thymine and cytosine while assigning the heaviest nucleotides, A and G, to the lowest notes in the scale and the lightest, T and C, to the highest notes (FIGURE 2). Since this transformation did not produce music per se, they applied several melodies similar to those of classical music to the various patterns of repetition in the genes, each with its different clef, time and rhythm, after which they selected those that sounded the best. This is how they transformed fragments of genes, such as the gene of glycerol phosphate dehydrogenase enzyme, into music (FIGURE 3). Musical transformation carried out by Ohno & Ohno of a fragment of the human phosphoglycerate kinase gene. The Ohnos needed a lot of “ingredients” to obtain their music and although the music has aesthetic values for some (the Ohnos themselves thought that some genes sounded like a funeral march and others like lullabies), others are the opinion that they sound terrible and are of little scientific value. From the time of the Ohnos, there have been many attempts to transform the information contained in genes into music, not only by using their nucleotide sequence as a starting point, but also their amino acid sequence and even taking into account the epigenetic modifications undergone by the nucleotides. 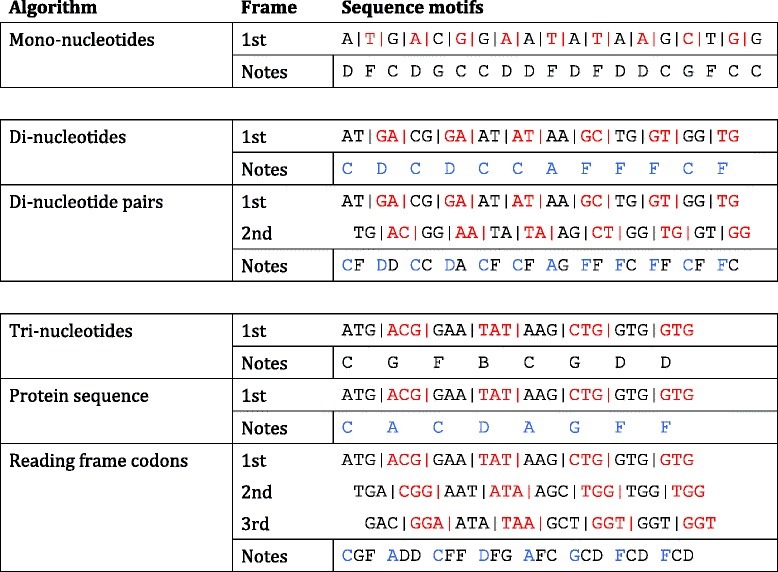 As regards the nucleotides, attempts have ranged from using only 4 musical notes for each of the 4 nucleotide bases to working with combinations of dinucleotides or trinucleotides. 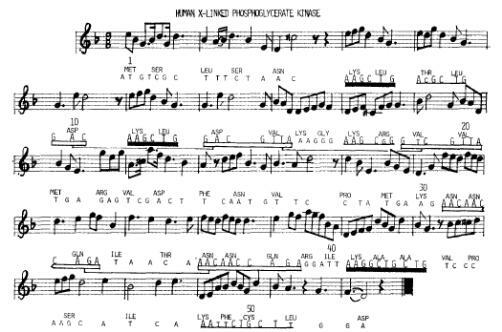 To obtain the musical expression of the epigenetic modifications experienced by the DNA (basically, the addition of a CH3 methyl group to certain cytosines, which can change gene expression) the note assigned to the cytosine was modulated with a flat to change the note. The following video shows an example of the sound of an immunoglobulin gene fragment played on the piano, according to the Ohnos. The problem posed by the proteins that arise from genes is that there are more amino acids (20) than notes in the basic musical scale (7). This was solved, on the one hand, by using a musical scale expanded to 12 notes, by adding flats or sharps to each note. Another solution has been to assign the same musical not to amino acids that are similar. For instance, the same basic musical note was assigned to leucine and to isoleucine, but one amino acid was distinguished from another by identifying the first with the basic musical note and the other with the same note in the musical scale, but reversed. Lastly, the lowest notes on the musical scale have been assigned to hydrophobic amino acids (alanine, valine, etc.) and the highest ones to those that are hydrophilic (serine, threonine, etc.). There have even been attempts to assign different chords (combinations of several notes) rather than notes to various amino acids and nucleotides. The musical transformation of both amino acids and nucleotides has also been attempted by using their physical properties and the structures acquired by the macromolecules – the proteins and DNA they form a part of – such as spirals and twirls, rather than the elements themselves. In both cases, in addition to performing the musical transformation manually, computerized algorithms have been used to make the process faster and more objective. These ideas have resulted in many musical transformations of gene nucleotide and amino acid sequences (2). All these attempts share the need for subsequent arrangements (how appropriate) by the authors, by adding melodies, clefs, rhythms, tempos, beats, etc. to make the genes sound musical. This may be why there are those who criticize this type of music, those that consider it to be music in genes, rather than music of genes. What use is there for genetic “musical scores”? In some cases, the musical transformations of nucleotide and/or amino acid sequences have been used to reach medical or scientific conclusions (3). The sound of normal genes compared to their mutated versions can be used to detect certain types of cancer, such as prostrate cancer and conditions such as Huntington’s disease. These studies can also be used to detect changes in gene expression associated with certain diseases or even to distinguish genetically identical monozygotic twins, which could serve forensic medical purposes. Moving beyond the medical field. the comparison of musical transformations of genes can serve to establish phylogenetic similarities or to integrate the genes of microbial marine ecosystems at a given time or place to monitor how these vary over time and in each location. Finally, more radical proposals have arisen to demonstrate that the music generated by the DNA can be used directly as a scientific tool and not only for its aesthetic value, such as the one made recently by the Australian scientist M.D. Temple who has used the sonification technique (4). This entails directly analyzing the musical notes produced from the nucleotide sequences of the genes with no additional arrangements and computerized by a series of algorithms based on biological rules (Figure 4). Specifically, the algorithm based on overlapped trinucleotides is capable of detecting where genes start and end, zones that are repeated and/or non-functional, mutations, etc. within nucleotide sequences. Indeed, this author’s articles contain examples of how these are detected by the characteristic sound of genes. Thus, the author proposes combining this type of tool, which works “by ear” with existing visual and analytical tools to study the nucleotide sequences of genes and genomes found in the enormous databases that are currently available, where the main difficulty is to sort and make sense of them. Musica may be the hidden language behind various scientific patterns and evidence. The idea of the Ohnos to transform nucleotide information of genes into music has borne much fruit, such as the appealing possibility of using it in the medical and scientific fields. Another idea found in the original article by the Ohnos, the reverse transformation of the musical compositions, as Chopin did on occasion, of nucleotide sequences has “revived” recently due to evidence that the DNA is a matchless medium for storing musical information. There are many publications and websites on “the music of genes” and “protein music, but M.A. Clark Genetic Music: An Annotated Source List may be the most complete and the one with the best compilation of the authors who have intervened in developing this idea. Temple MD.2017. An auditory display tool for DNA sequence analysis.BMC Bioinformatics, 18,221. And an article published for general public consumption on June 20 2017 by the same author in The Conversation: What does DNA sound like? Using music to unlock the secrets of genetic code.